Molto tempo fa viveva nell'isola di Bali Ketut, uomo che da povero era diventato ricco piantando riso. Le sue risaie nelle pianure dell'isola erano le più belle mai viste. Ketut aveva molti operai nelle sue risaie e ogni tanto qualcuno di loro veniva a chiedergli un piccolo prestito per comprare un pezzetto di terra e piantare lui stesso il riso. "Padron Ketut - disse un giorno Kuan - mi daresti trenta monete ché vorrei comprare quel terreno là, è molto buono per piantarvi riso". "Sì - rispose Ketut - vieni tra due giorni e ti darò il denaro". Nel frattempo tuttavia, Ketut corse dal proprietario del terreno e lo comprò lui per trentuno monete. Così facendo il furbo Ketut acquistava piano piano tutte le piccole risaie di pianura che i suoi poveri operai via via cercavano di comprarsi. Tra gli operai che lavoravano per padron Ketut c'era Wayan, un montanaro che abitava lassù, a Jatiluwih, da dove scendeva per lavorare in risaia. Solo poche volte all'anno Wayan ritornava alla sua pietrosa terra che però non produceva nulla, tante erano le pietre nel terreno, e ad ogni ritorno Wayan era sempre più triste. Una sera di quelle, seduto nel piccolo orto tra i sassi, Wayan pianse talmente che Pantaj, la vecchia tartaruga che il nonno gli aveva regalato, cominciò a sguazzare nella piccola pozzanghera che si era formata con le tante lacrime di Wayan. Pantaj, per sguazzare meglio, con il becco cominciò a portare fuori dalla pozzanghera tutti i sassi che vi erano, cosicché si formò una piccola vasca di terra e lacrime e lì Pantaj, che di anni ne aveva cento e aveva buona memoria, cominciò a piantare, sempre con il suo becco, i piccoli chicchi di riso presi dalla bisaccia di Wayan, che dalla tristezza non voleva più mangiare. Dopo alcune mattine, Pantaj chiamò forte: "Wayan, Wayan amico mio, vieni a vedere cosa è successo!" Con grandissima sorpresa la piccola vasca formata dalle lacrime di Wayan e dal lavoro di Pantaj era tutta una macchia di verde riso che stava germogliando. E come crebbe bene quel riso, tanto che al contadino venne l'idea di riprovare e provò a piangere di nuovo... ma non essendocene motivo (a Wayan la tristezza era passata a vedere quel bel riso) non gli venivan le lacrime! Pantaj capì il pensiero del suo amico e gli disse: "Senti Wayan, proviamo a preparare altre pozze di terreno togliendo i sassi e proteggendole con piccoli recinti di terra, come piccoli giardini, uno sopra l'altro, così che l'acqua dei monsoni che sta per arrivare li colmi tutti e non scappi giù per la montagna". 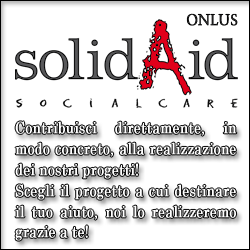 I due amici lavorarono giorno e notte, per liberare il terreno dai sassi, e alla tartaruga Pantaj spesso il becco sanguinava, dal duro lavoro, e qua e là lasciava gocce di sangue, ma in silenzio, senza lamentarsi mai. I monsoni poi fecero il resto, colmando le piccole terrazze di acqua, così che Pantaj e Wayan piantarono subito dopo i semi di riso. Il raccolto fu veramente abbondante e il riso di montagna ancora più saporito di quello di pianura e Wayan fece come padron Ketut.... comprò via via altro terreno di montagna, chiamando anche i vecchi compagni d'opera a lavorare le sue risaie. Alcuni di loro, anche se un po' increduli, comprarono terreno di montagna... che costava poco e nessuno voleva e, dopo un duro lavoro, lo prepararono a forma di terrazza una sopra l'altra, stupendo tutti coloro che venivano a vedere queste montagne e colline trasformate in tante piccole pianure una sopra l'altra e colme di spighe di grani di riso. Un fatto straordinario poi successe: nelle risaie di Wayan laddove la tartaruga Pantaj aveva sanguinato il riso crebbe di colore rosso e ancora oggi è tra i tipi di riso più buono e prezioso di tutta l'isola di Bali. 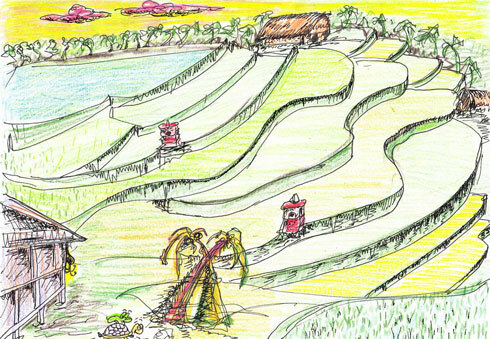 Once upon a time there lived on the island of Bali a man called Katut who planting rice had turned from poor to rich. His rice fields in the plains were the best ones ever seen. Ketut had may workers in his fields and from time to time one of them borrowed a little money from him to buy a little piece of land and plant rice himself. "Master Ketut" one day Kuan said "would you give me thirty coins, I'd like to buy that land over there, it's excellent for rice". "I will" said Ketut "come back in a couple of days and I'll give you the money". However, meanwhile Ketut rushed to the land's owner and bought the land for thirty-one coins. Thus the sly Ketut gradually bought all the little rice fields his poor workers were trying to buy for themselves. Among the workers there was one who lived on the mountains, his name was Wayan and he lived up there in Jatiluwih and came down to work. Only few times a year did he go back to his stony land, which, however, did not produce anything because the stones in the soil were so many and Wayan became sadder and sadder every time he went back. 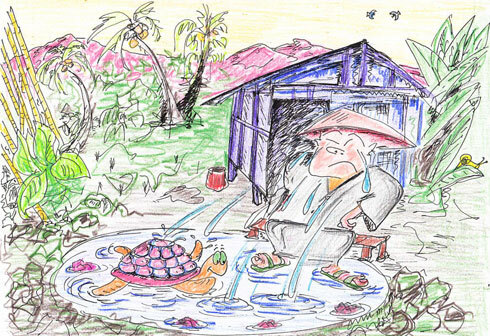 One of those evenings, sitting in the little garden among the stones, Wayan cried so long that Pantaj, the old tortoise his grandfather had given him, began splashing in the little puddle which Wayan's many tears had formed. Pantaj took all the stones out of the puddle with his beak so as to wallow better, thus forming a hole full of earth and tears. Pantaj, who was a hundred years old and had good memory, began to plant with his beak the little grains of rice he had taken from Wayan's sack: he was so sad actually he did not want to eat any more. A few mornings later, Pantaj called out loud: "Wayan Wayan my friend, come and see what's happened!" To their great surprise the little basin made from Wayan's tears and Pantaj's work had become a blotch of sprouting green rice. The rice grew so well that the peasant thought he would have another go and tried crying again... but since he had no reason to (at the sight of that beautiful rice Wayan was not sad any more) no tears came out! Pantaj read in his friend's mind and told him: "Listen Wayan, let's try and make more holes taking the stones out and protecting them with little enclosures of earth, like little gardens, one above the other, so that the water of the monsoons which is about to come will fill them all and won't escape down the mountain". The two friends worked night and day to get rid of the stones and Pantaj's beak often bled out of hard work and the soil was stained here and there with its blood, but he never complained. Then the monsoons did the rest, filling the little terraces with water. Immediately afterwards Pantaj and Wayan planted the rice grains . The crop was plentiful and the rice from the mountains even tastier than the rice from the pain and Wayan did like master Ketut... he bought more and more land on the mountains and called his old mates to work on his fields. Some of them, though a bit incredulous, bought land on the mountains... that was cheap and nobody wanted and through hard work they shaped it into terraces. Everybody who came to see the mountains and hills, turned into many little plains one above the other and full of ears of rice grains, was astonished. Then something extraordinary happened: in Wayan's fields where Pantaj had bled rice grew red and to this day it is among the best and most precious rice in the whole island.